Multiple people were attacked in Manhattan. Michael George reports. 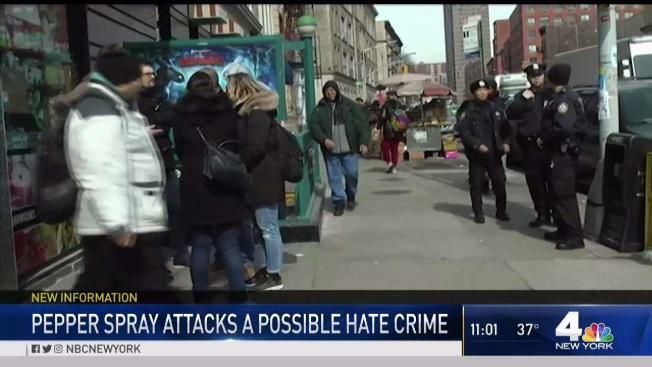 Police confirm they are investigating a bizarre Friday afternoon attack, in which a woman sprayed seven people in Manhattan with an unknown substance, as a possible hate crime. The female suspect is black, and all of the victims are white. The NYPD's Hate Crime Task Force was investigating. Police responded but were unable to catch up with the attacker, who is still on the loose. She appeared to be about 30 years old, 5 feet, 6 inches tall, roughly 200 pounds, the NYPD said. She was wearing a blue top, gray pants, and white sneakers. Anyone with information was asked to call the NYPD's Crime Stoppers hotline at 1-800-577-TIPS.